In my last outing, I expressed my concern that if the inconsistent play of the offensive line of the Patriots over the last three games of the regular season continued, that it could lead to an early departure from the playoffs. Except for the second half of the Miami game (the first of those last three contests) which they won 41-13, the line and thereby the offensive, has struggled. Now as if to prove me right, the football gods have arranged for the Patriots to meet in the conference semi-finals, arguably their most difficult match up, the Baltimore Ravens. I could have done without the anxiety. As soon as the Ravens’ Wild Card win against Pittsburgh was sealed, the various talking heads and pundits began rolling out a variety of stats and facts, essentially aimed at explaining why the Patriots will be lucky to win in their own stadium. Some of it, at least to a point, is valid. 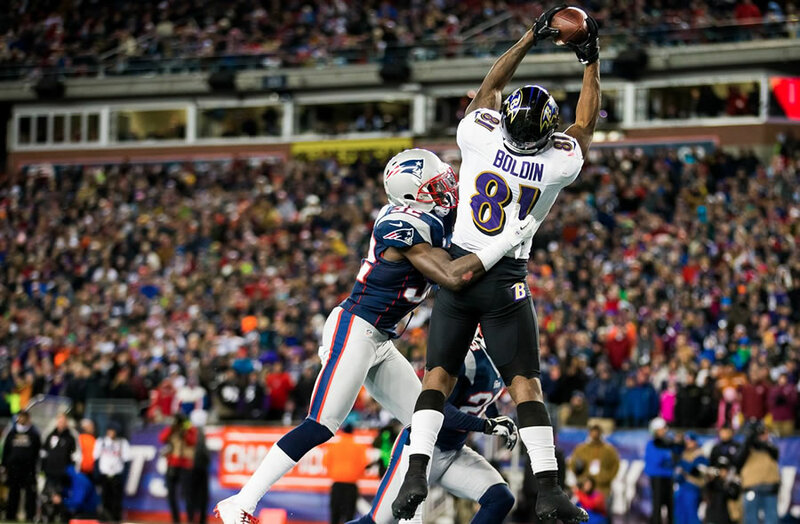 Baltimore has history on their side, coming into Foxboro three times in the last four years for playoff games and winning two of them. They have gone twenty-seven straight games without giving up a 100 yard rusher. Their very solid defensive front seven has been bolstered by the return from suspension of Haloti Ngata, their 6-4, 340 pound tackle. Joe Flacco is turning into a slightly younger Eli Manning who can look pretty average during the regular season, but who can be a standout performer in the playoffs. Finally, the Ravens, as do the Pats, have a strong special teams unit led by the return skills of Jacoby Jones. Now, all this is impressive, if not somewhat misleading. For example, I have not actually fact checked it, but I believe that the Pats were without a healthy Rob Gronkowski in all of those playoff games, and likely completely without him in at least one. (If memory serves, he was suffering from a high ankle sprain one of those years, which left him rather ineffective.) The last time the Patriots played the Ravens was, in fact, week sixteen of last year, a game that saw them blast Baltimore, 41-7 in Baltimore. That would count as one of the 27 straight games in the Ravens string of no 100 yard rushers, which is technically correct even though the Patriots running tandem of Blount and Ridley ran for 76 (2TDs) and 54 yards respectively, which I believe adds up to 130 yards. By the way, Baltimore has gone 16-11 in that 27 game stretch, which is solid but hardly impressive. Once again, I return to the play of the offensive line, specifically the play of the tackles, as the key factor. How Nate Solder vs. Terrell Suggs (12 sacks) and Sebastian Vollmer vs. Elvis Dumervil (17 sacks) turns out, will likely go a long way to deciding the outcome of the game. The return to health of veteran guard Dan Connolly, who has been slowed by head and ankle issues, would also obviously be a definite plus in helping to keep Tom Brady upright and effective. So, look for the Patriots to attack the Ravens the same way they took on the Detroit Lions and their number one against the run defense; through the air. In that week 12 game, Brady went 35/53 for 349 yards, 2 TDs, with 1 Int, on the way to a 34-9 victory. If the line holds up and they are able to go to their spread offense, the Patriots could potentially win relatively easily, maybe 34-17. If not, and the line struggles, I believe they could still win, but it would likely be a much closer score, perhaps in the 20-17 range.